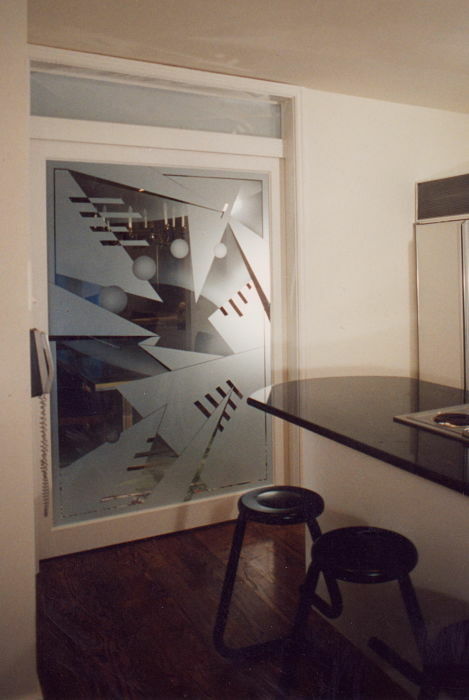 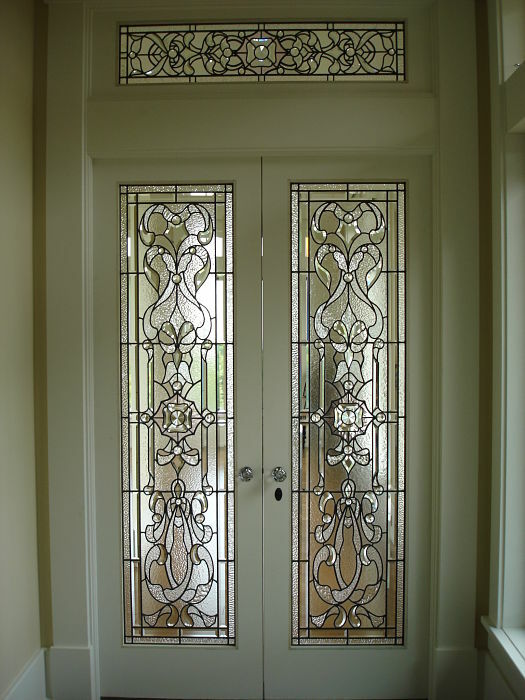 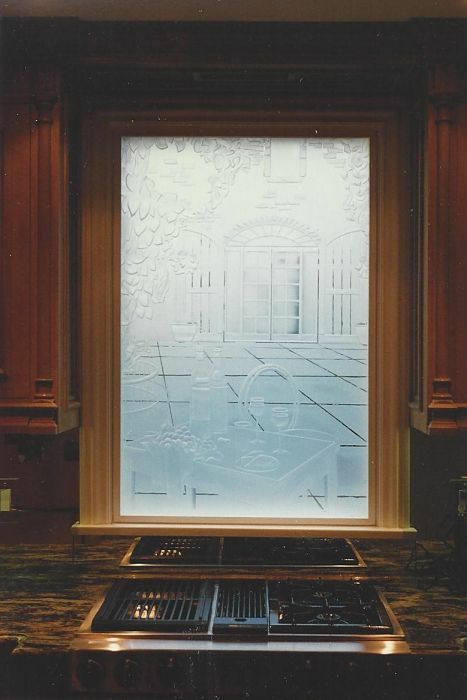 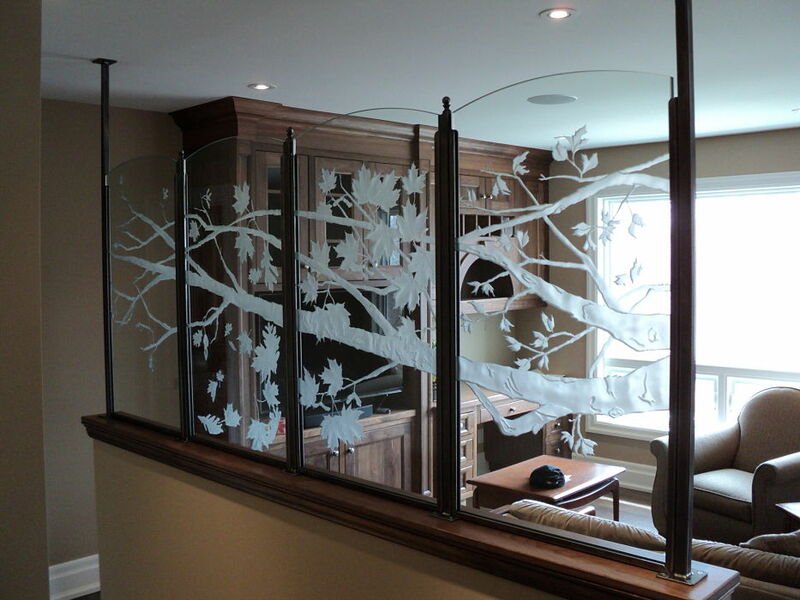 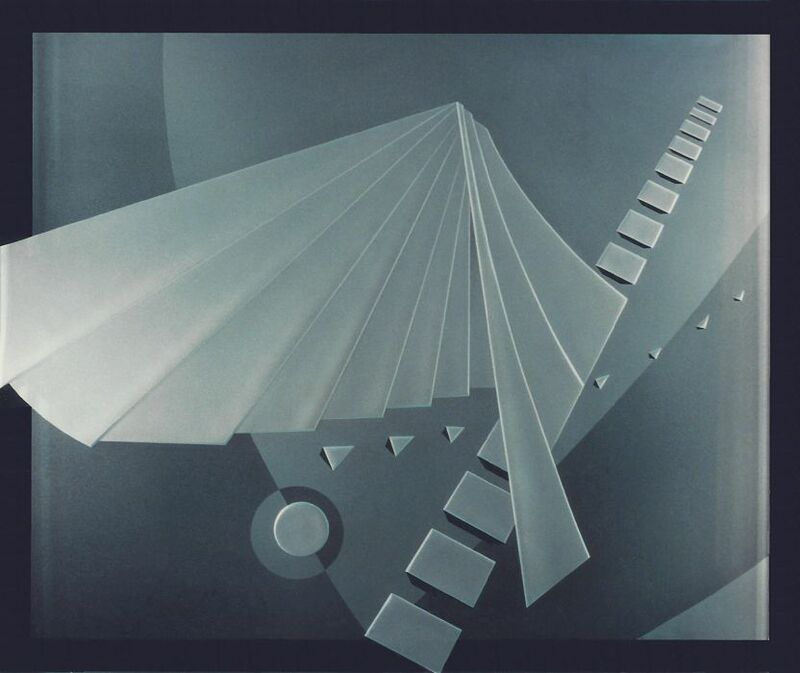 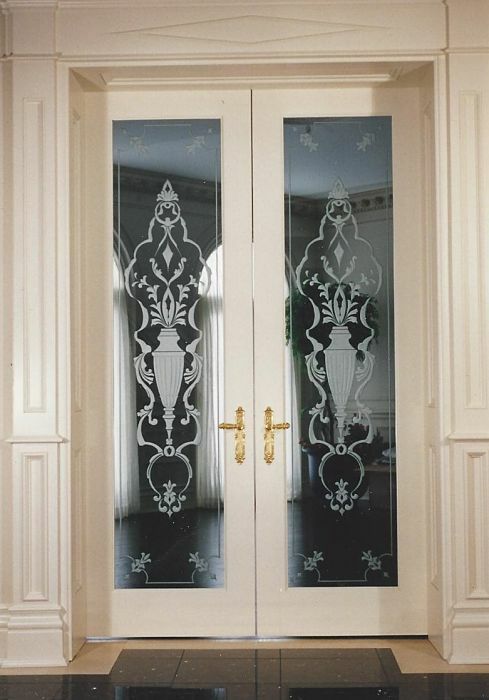 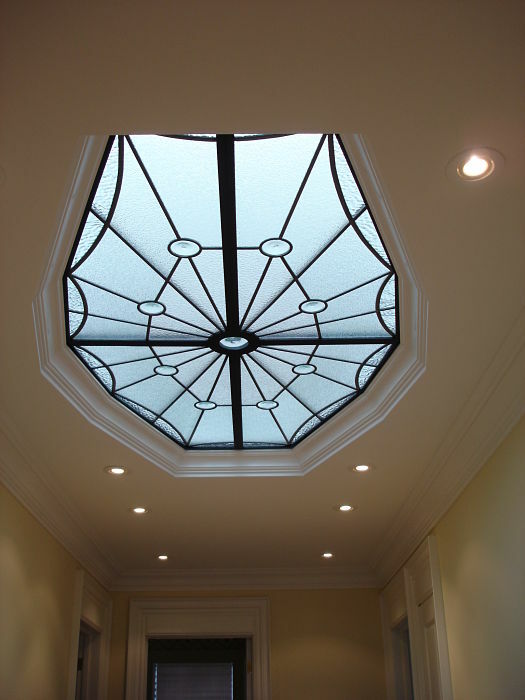 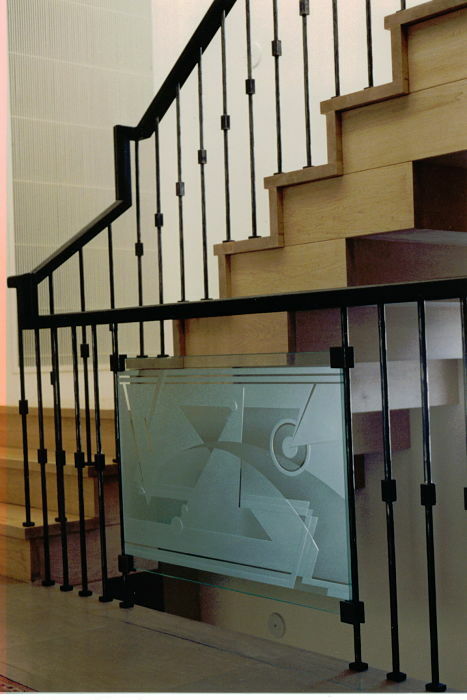 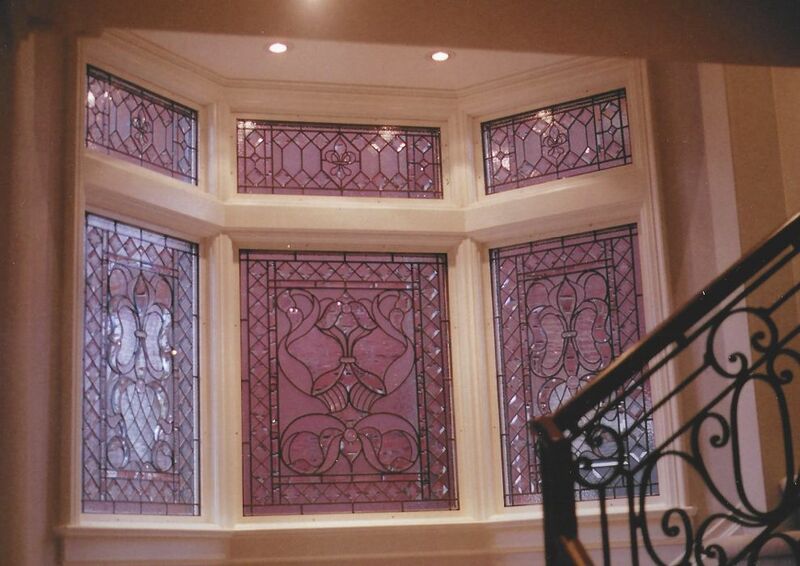 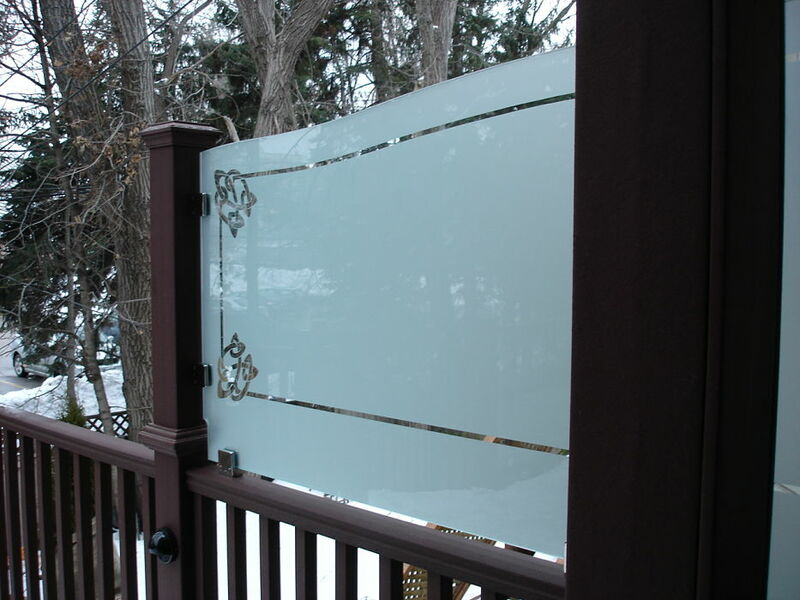 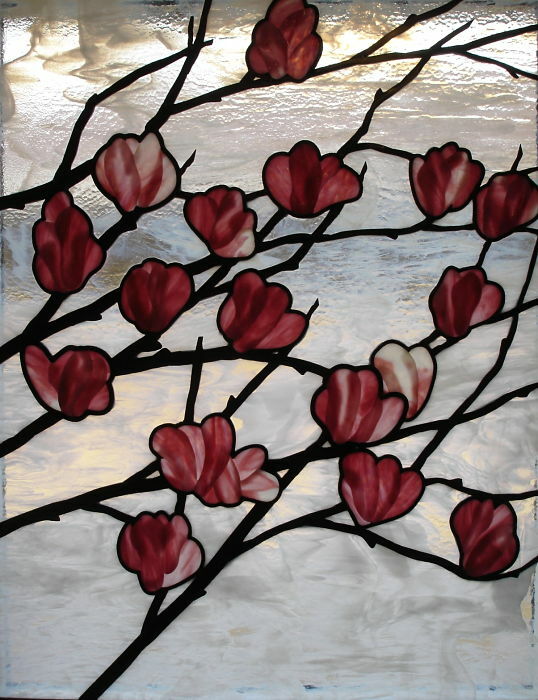 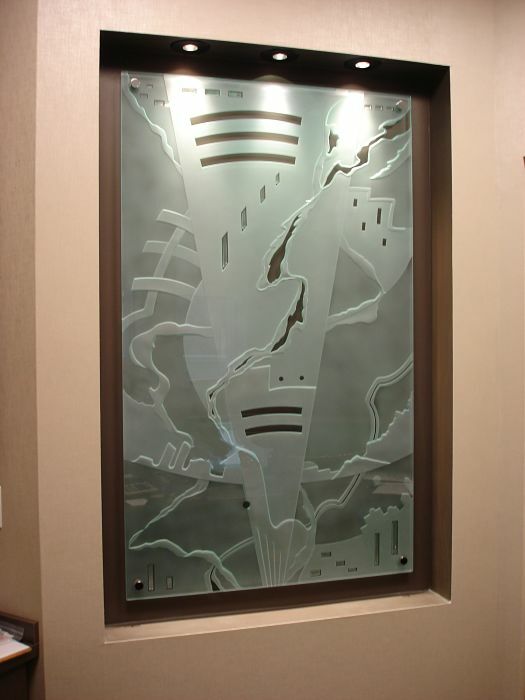 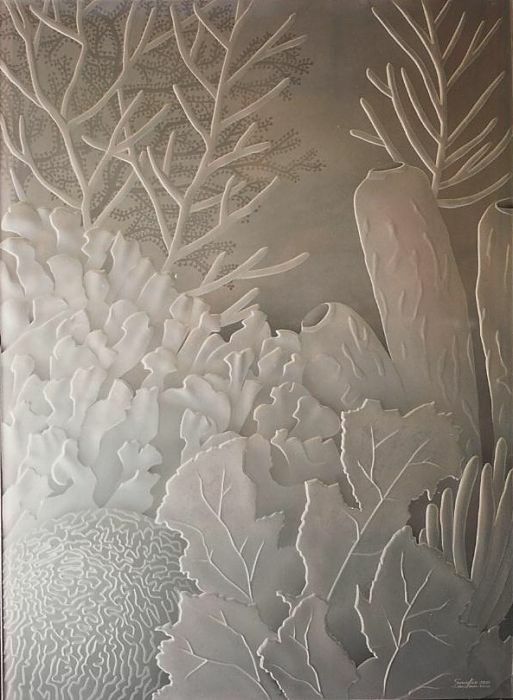 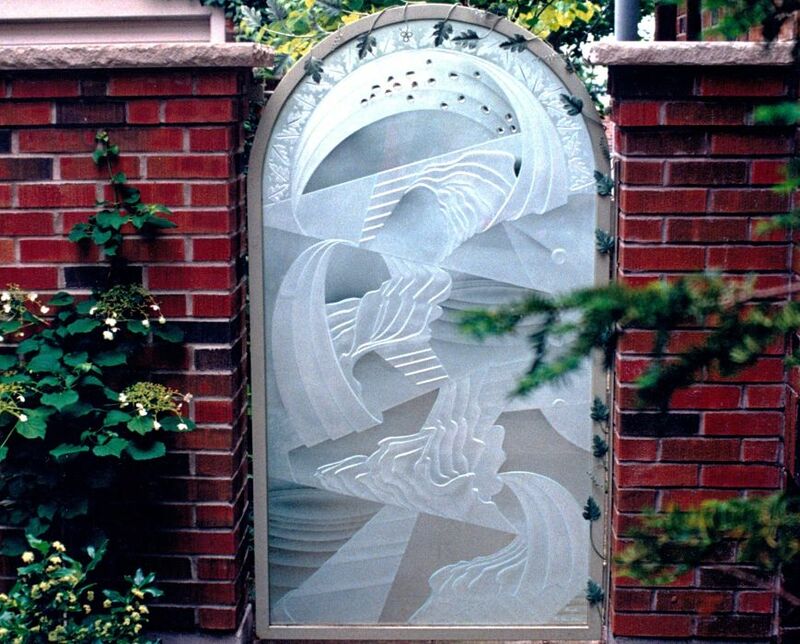 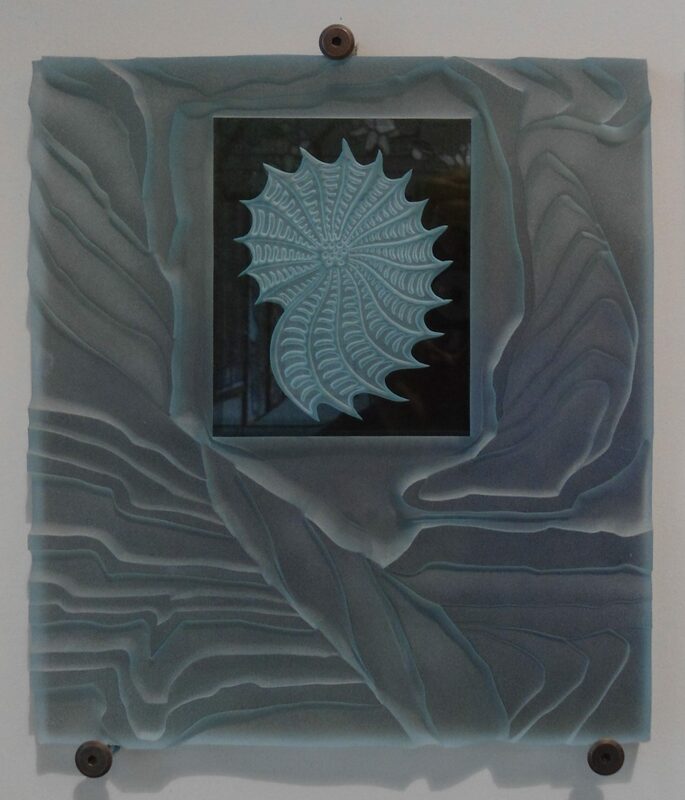 Scroll down for examples from our etched glass portfolio. 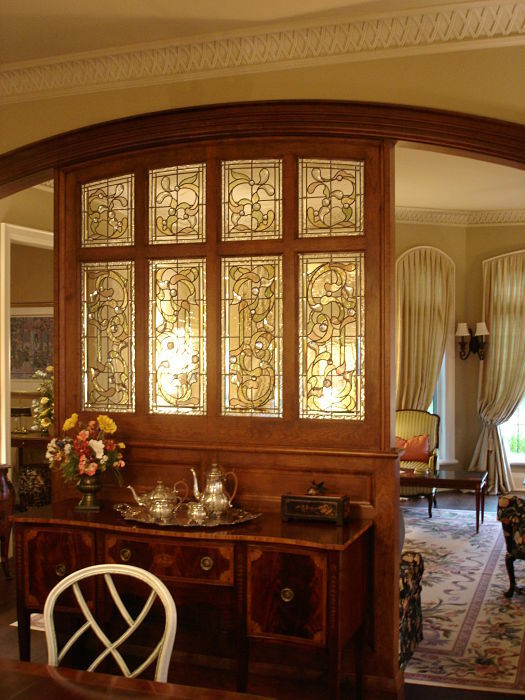 Click to enlarge for more information. 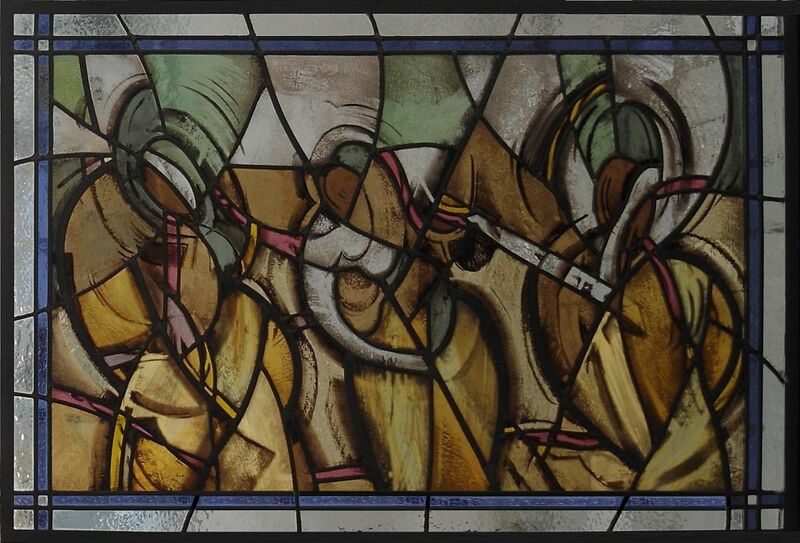 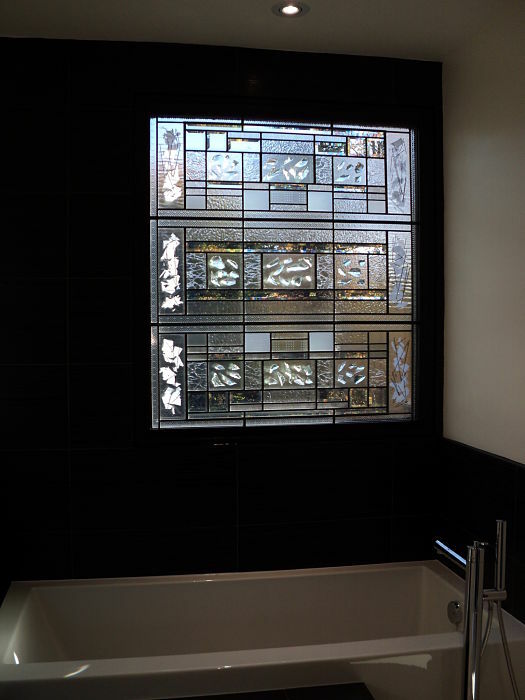 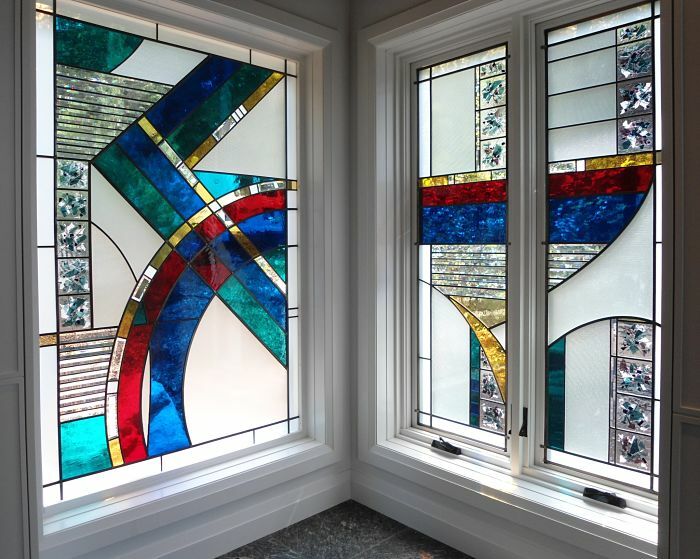 Abstract stained glass window made with German mouth-blown glass, hand-bevelled glass and individually fused glass tiles. 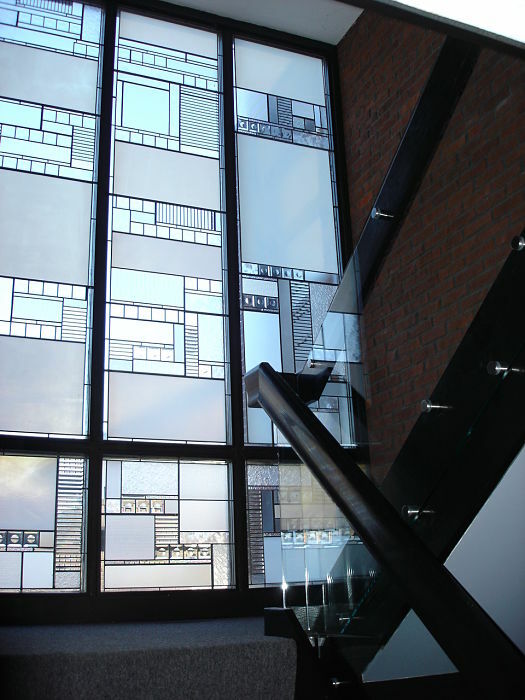 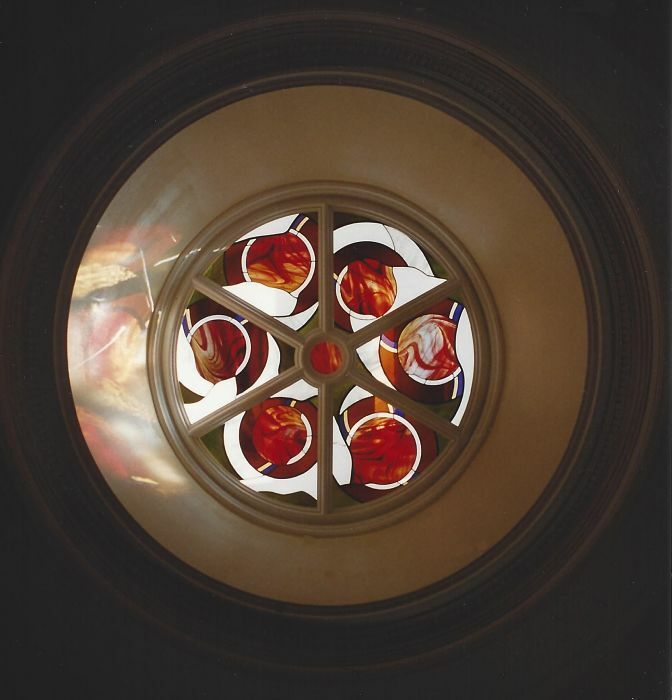 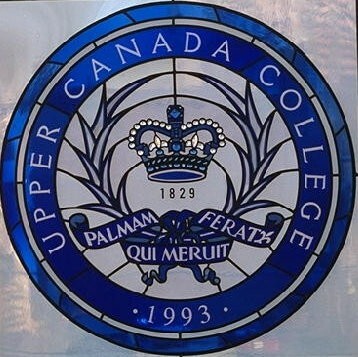 Stained glass window created by The Glass Studio for Upper Canada College. 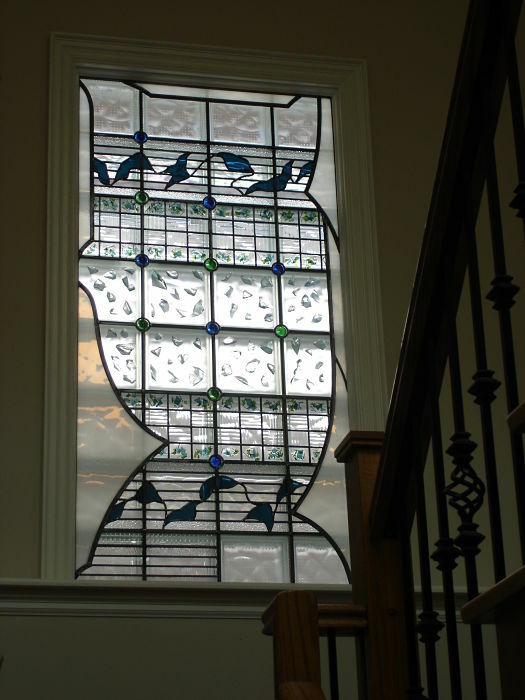 A second similar window was created for the Wilder Library. 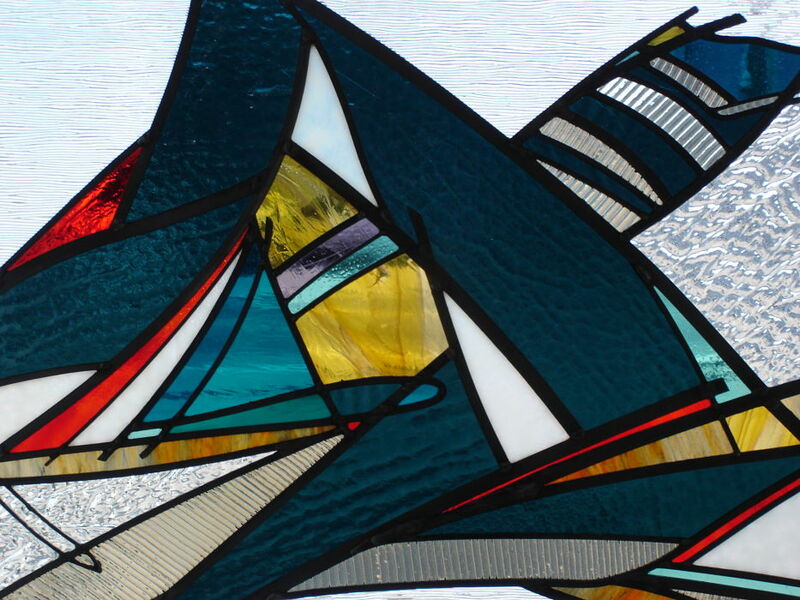 Leaded, iridized hand-cast glass with fused accents and architectural textures. 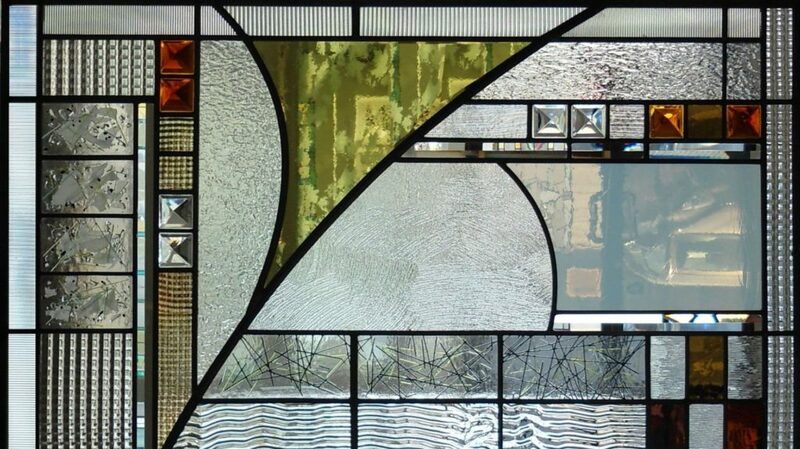 Commissioned as art for a dining room. 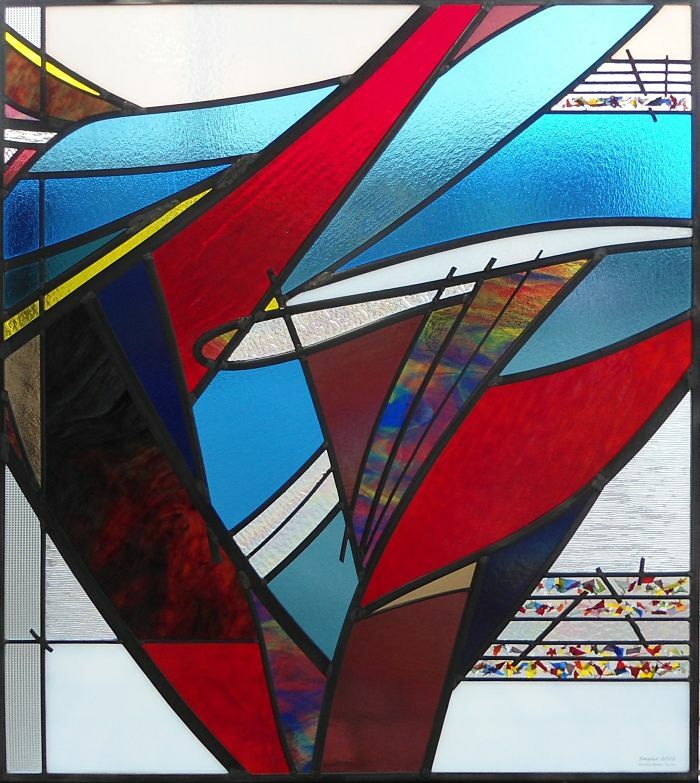 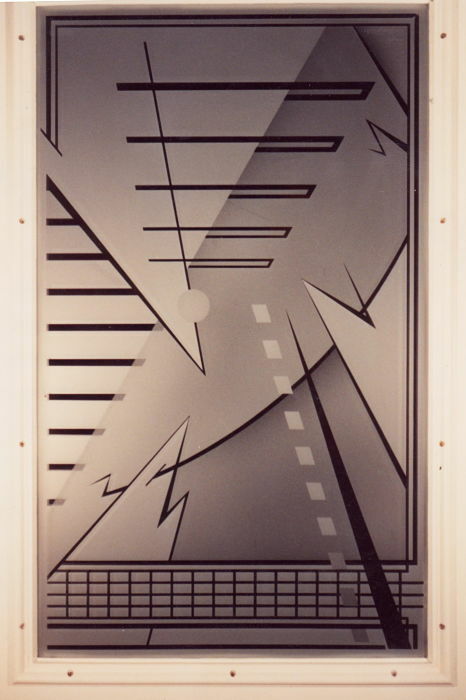 Stained glass abstract window designed by Thomas Smylie. 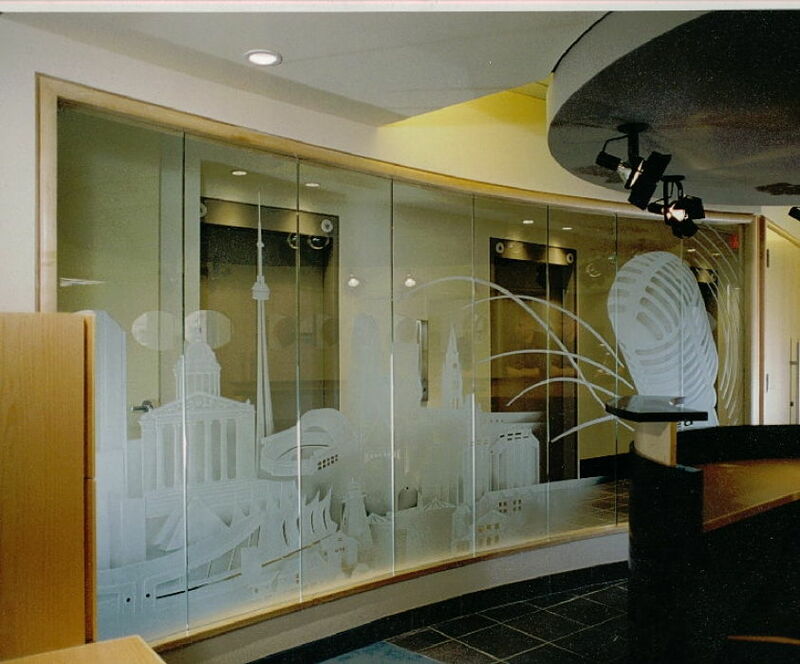 Commissioned by The Toronto Public Library Alumni Association to commemorate Lillian H. Smith. 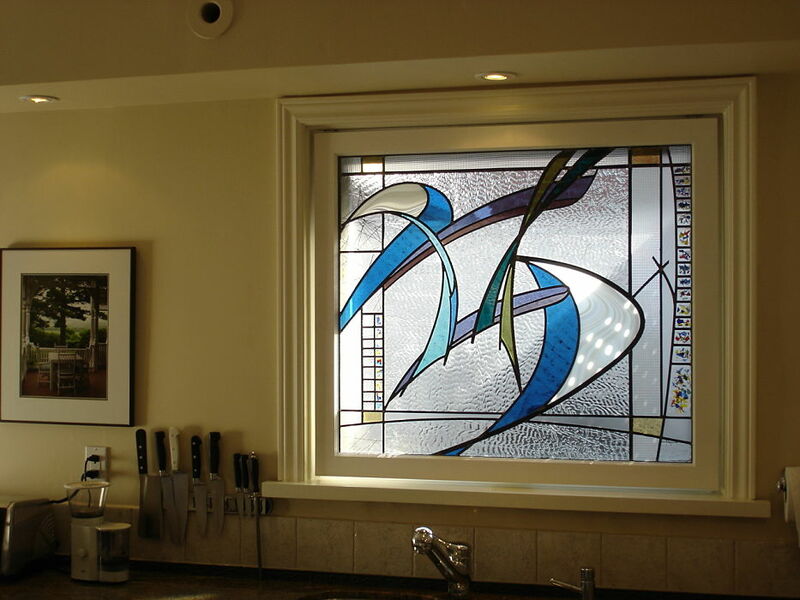 Installed in a custom bronze frame at 239 College Street, Toronto. 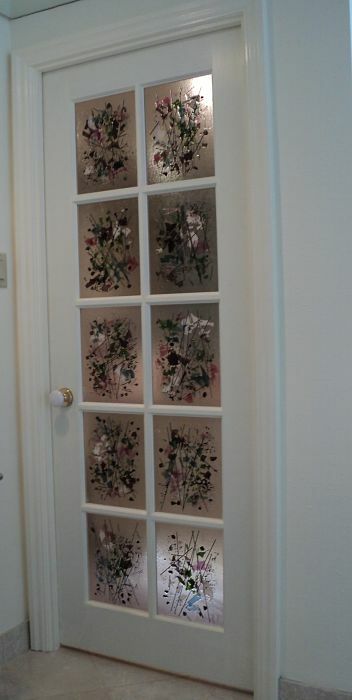 Size 96" wide x 36" high. 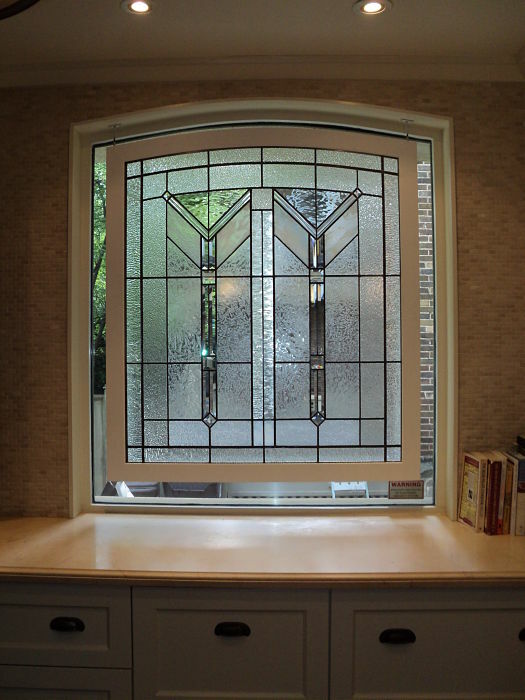 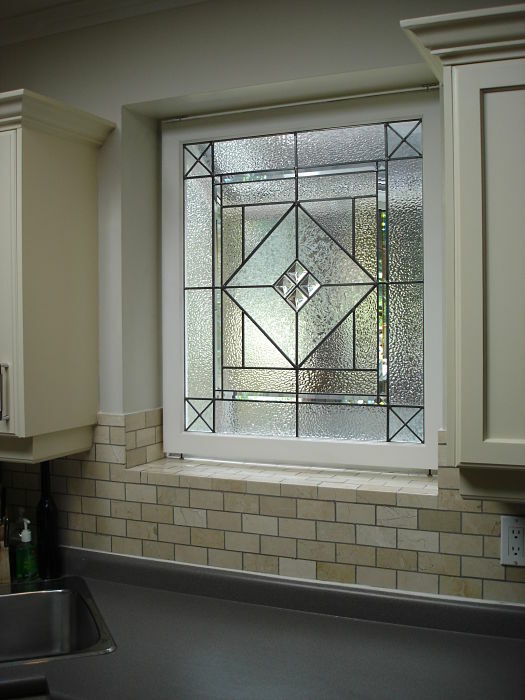 Leaded and bevelled glass kitchen and pantry windows. 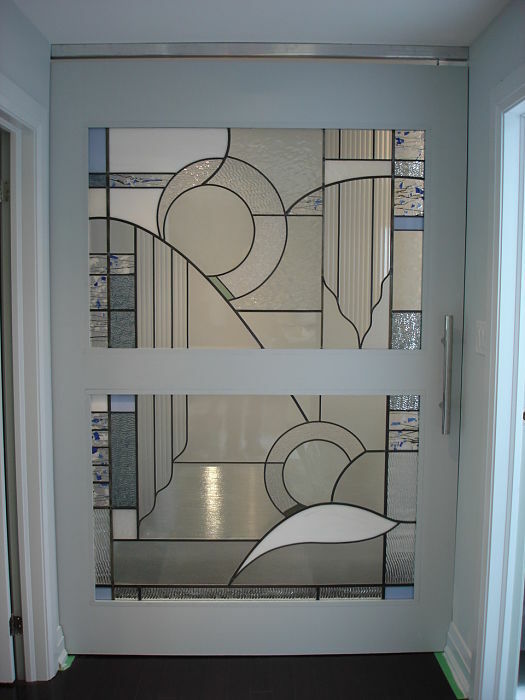 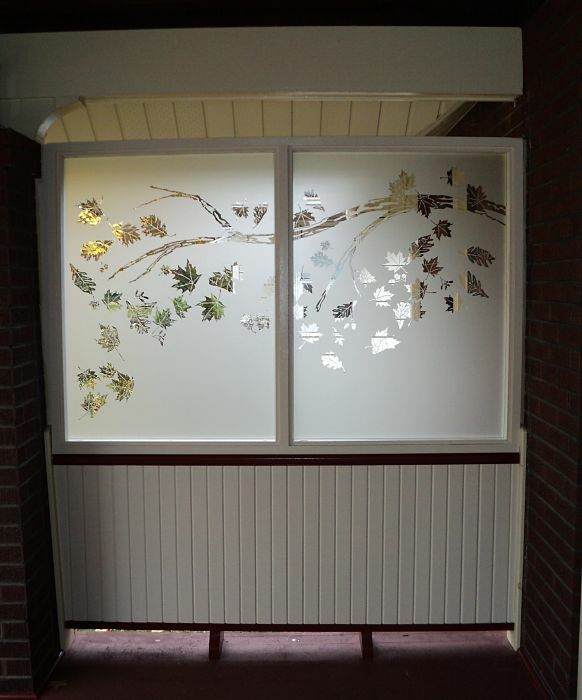 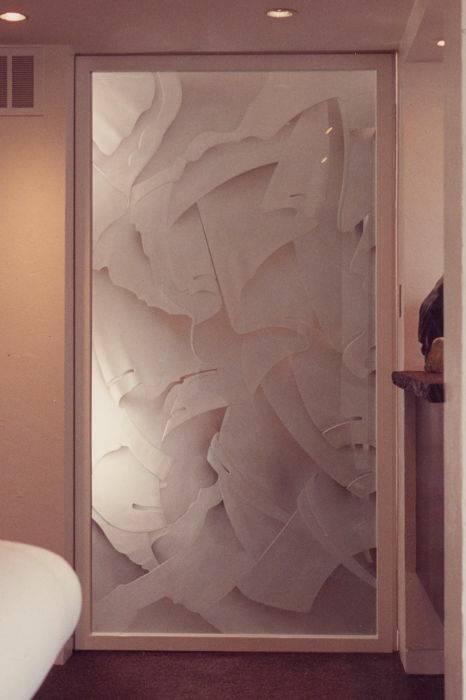 Stained glass abstract panels in a sliding pocket door. 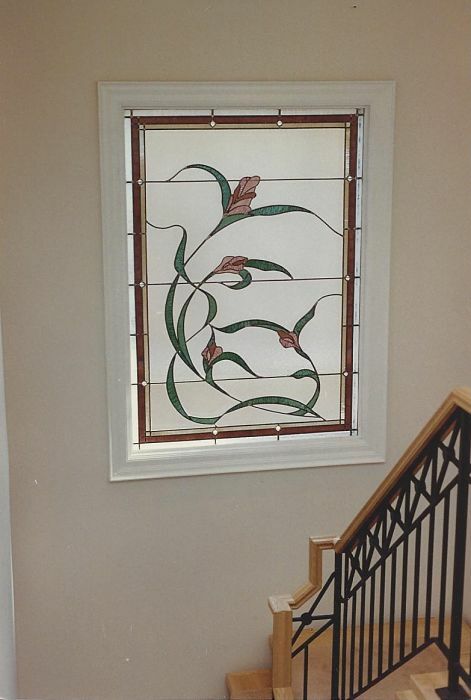 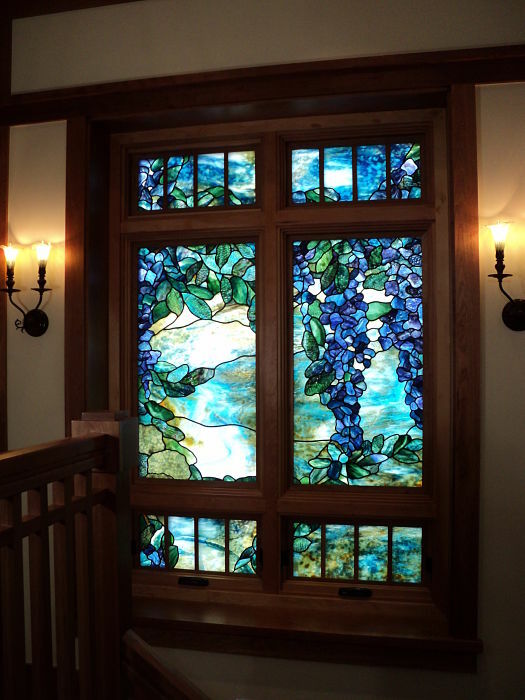 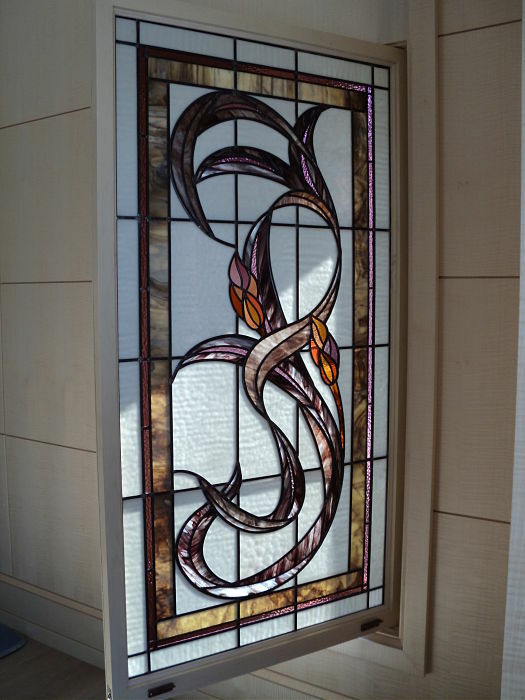 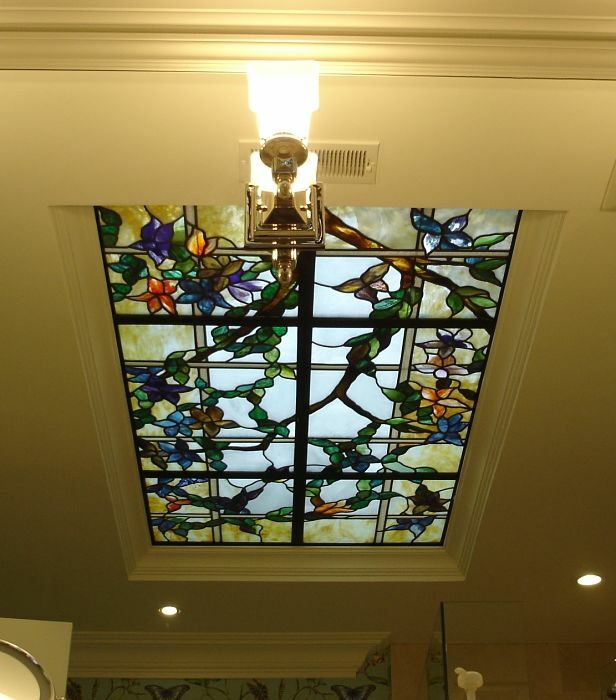 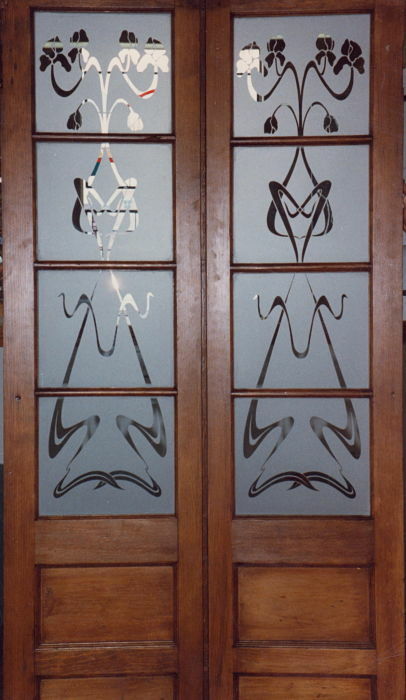 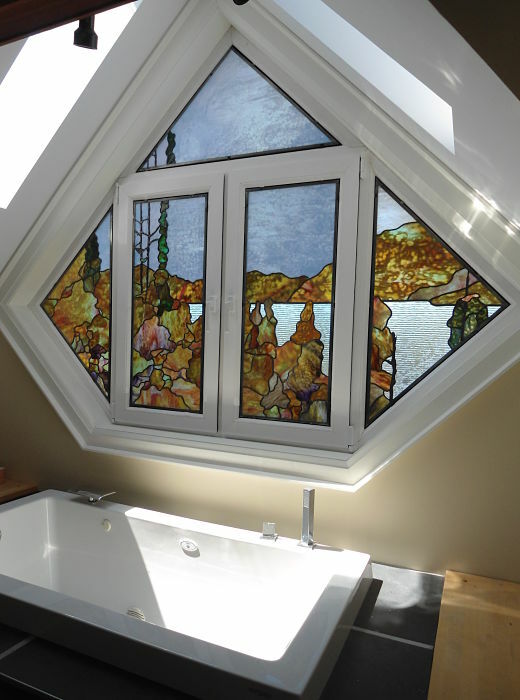 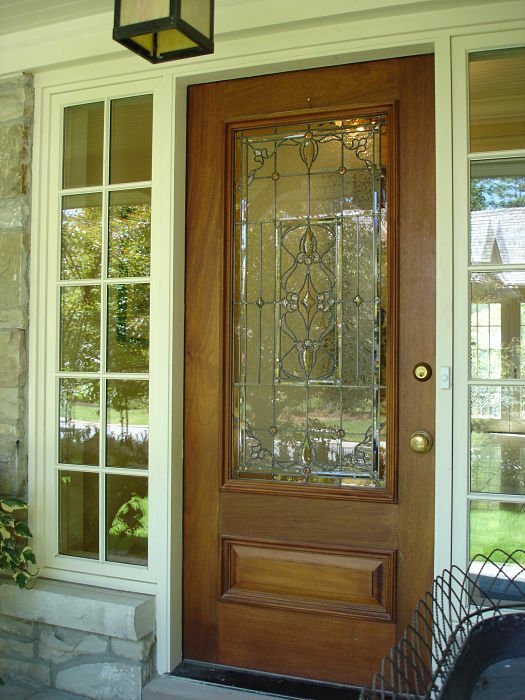 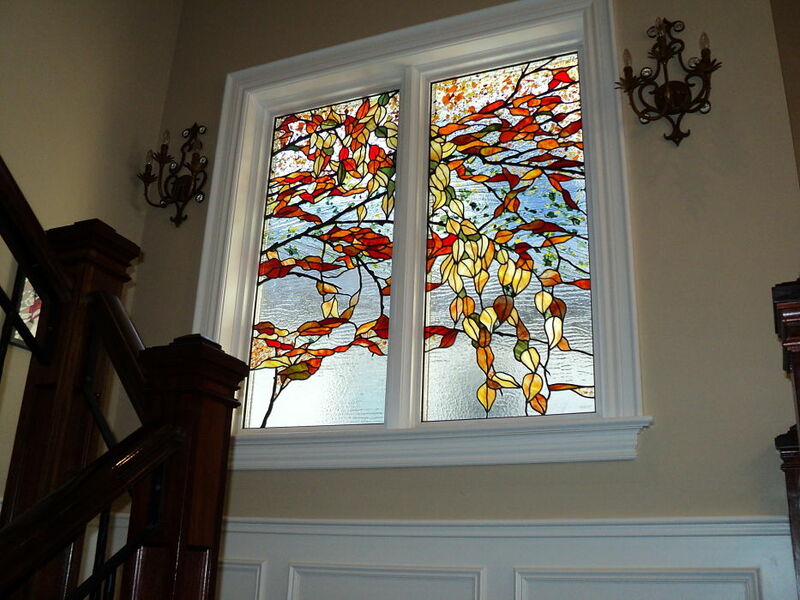 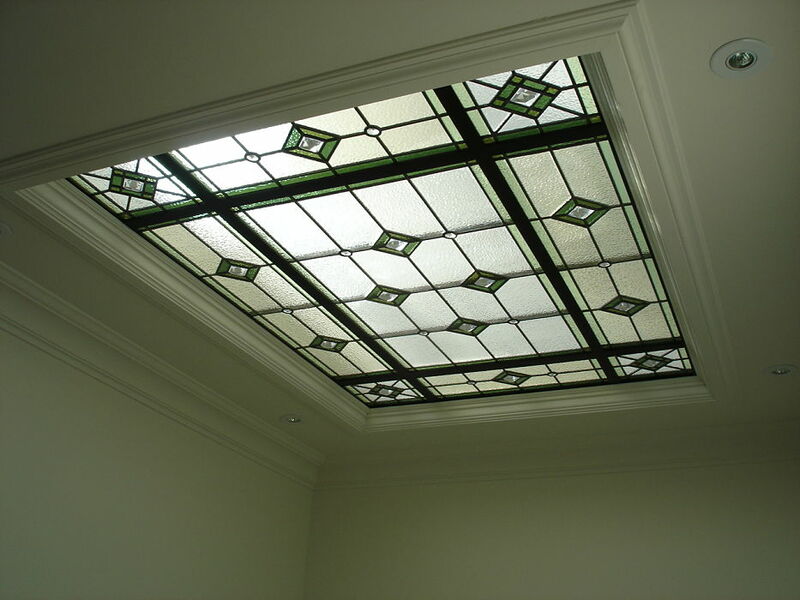 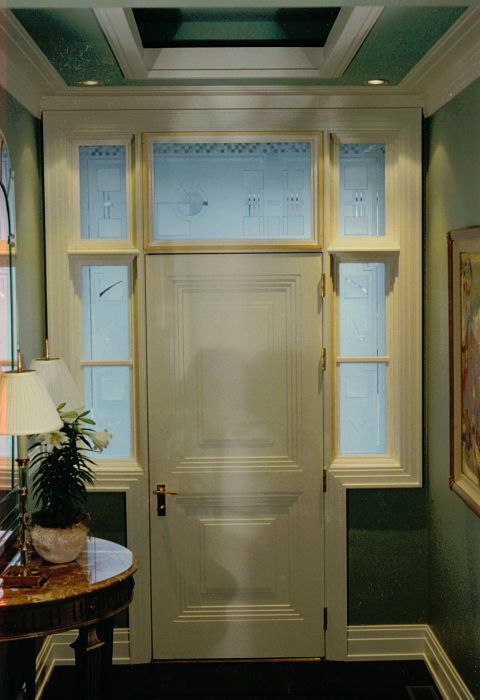 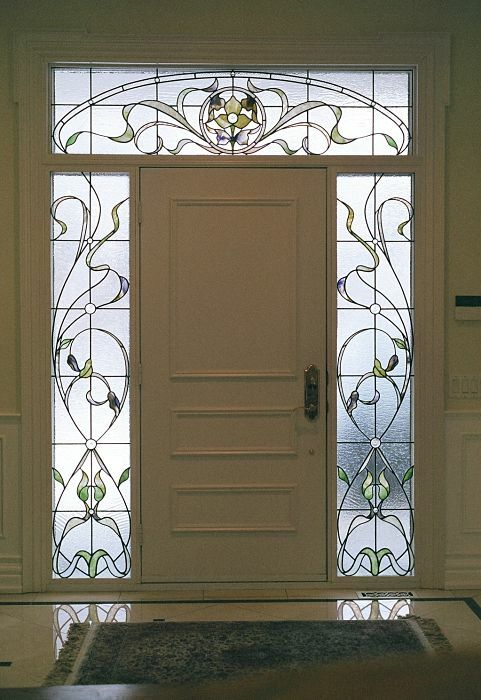 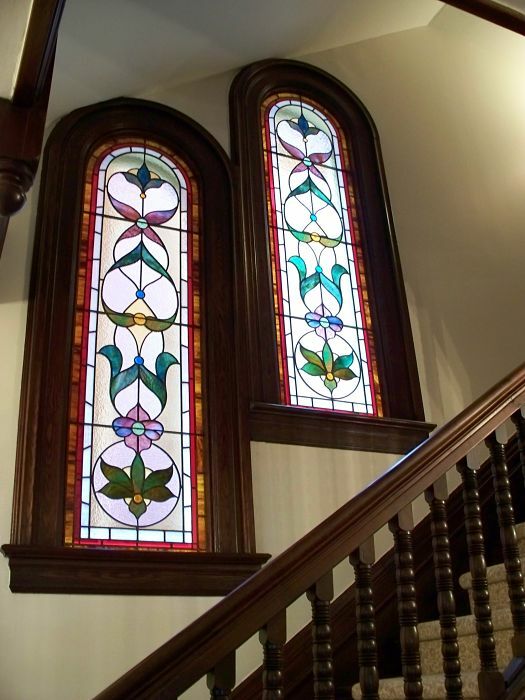 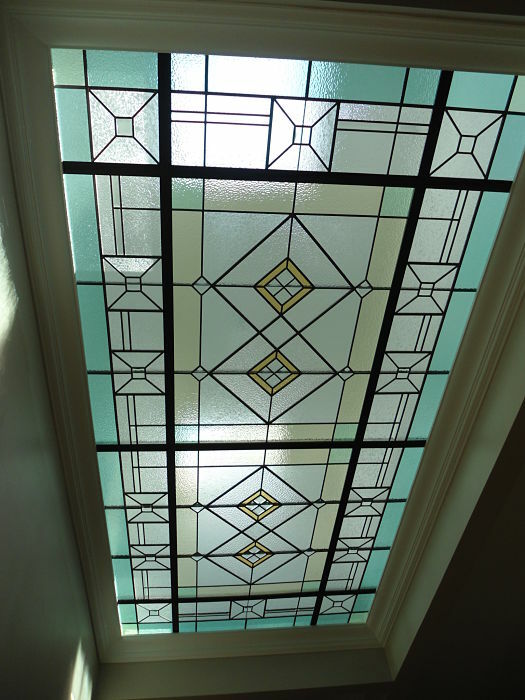 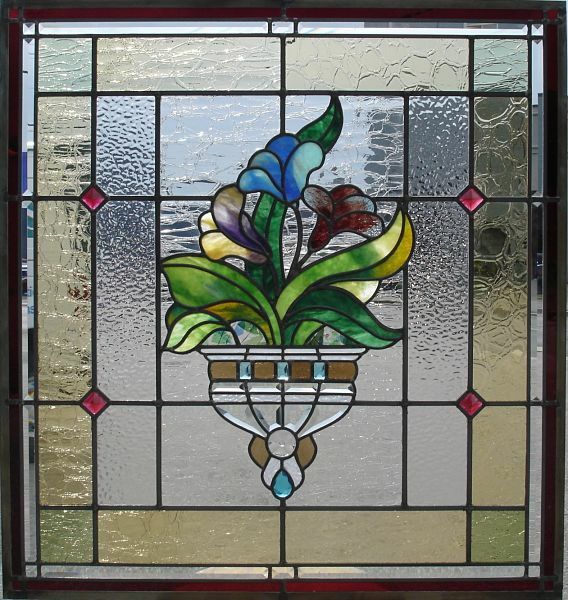 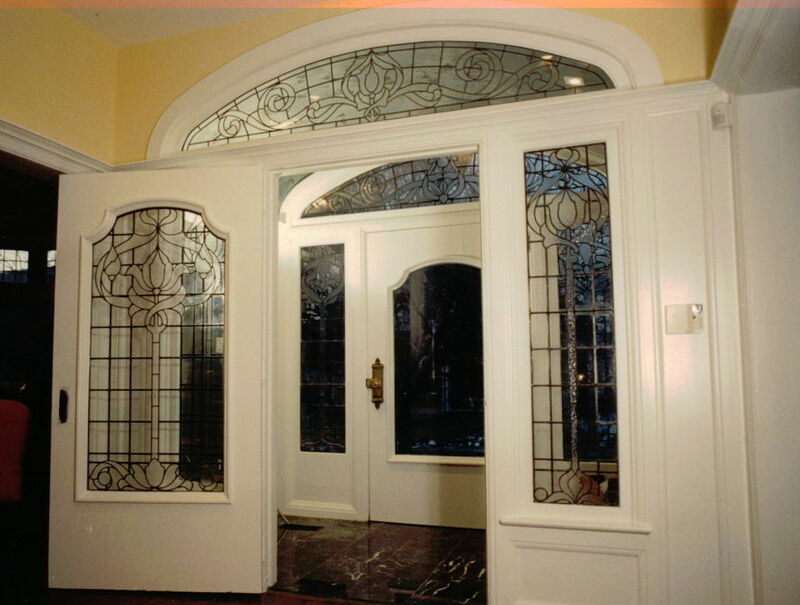 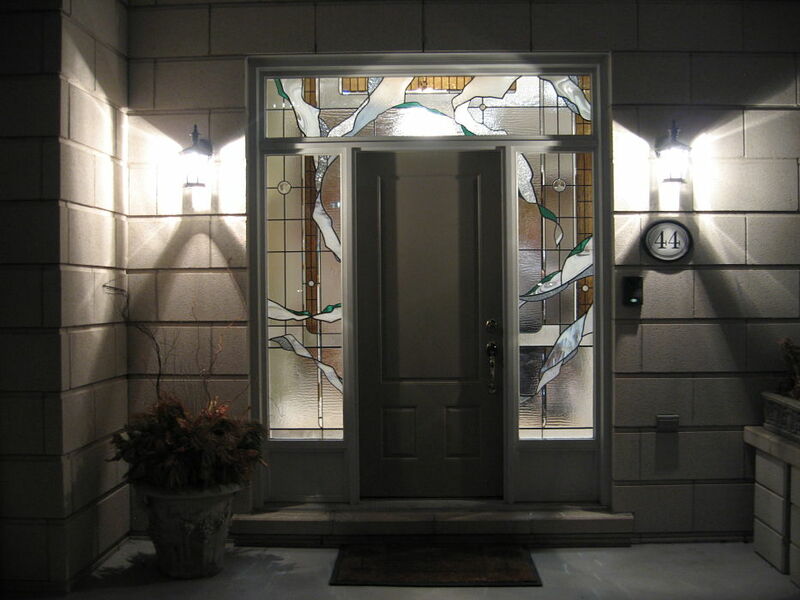 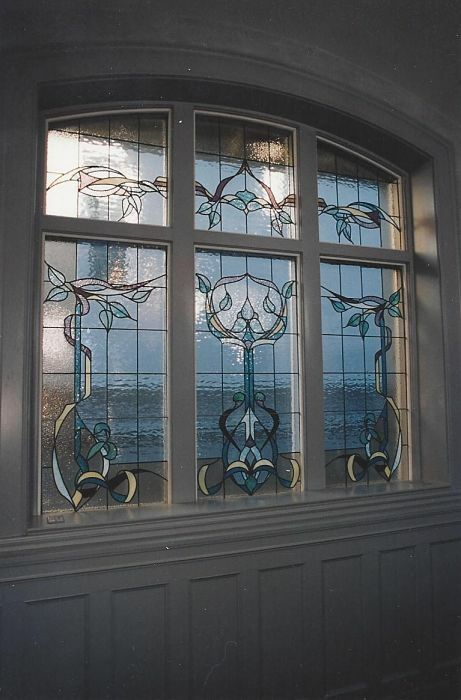 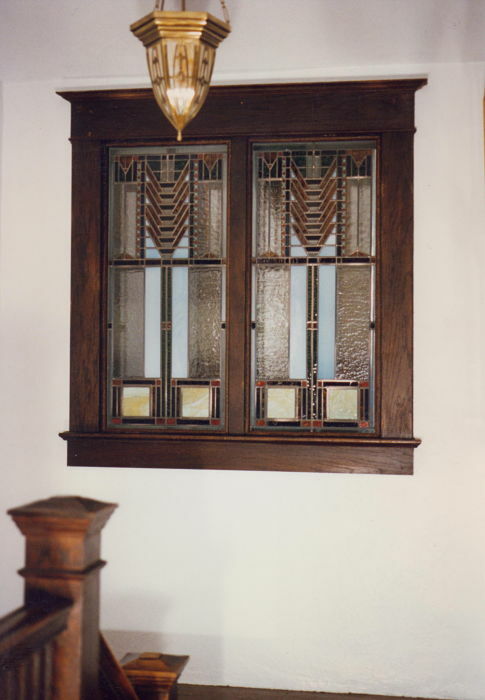 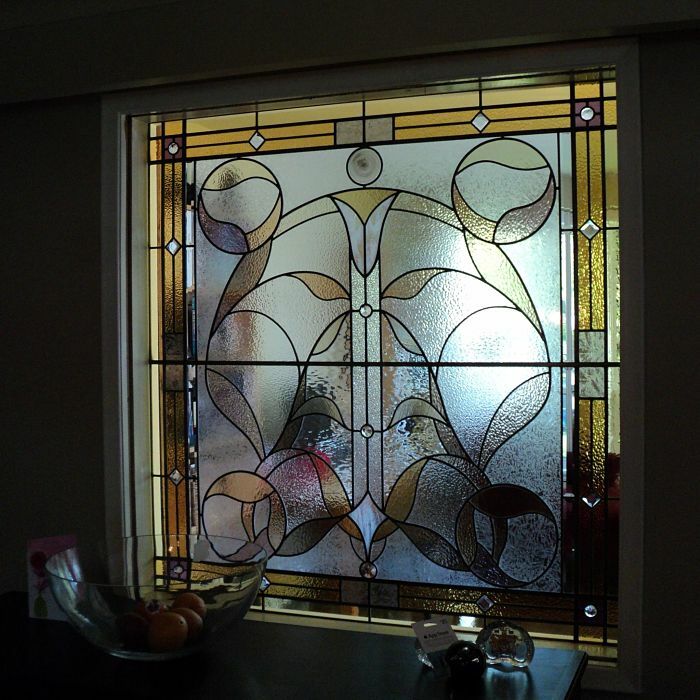 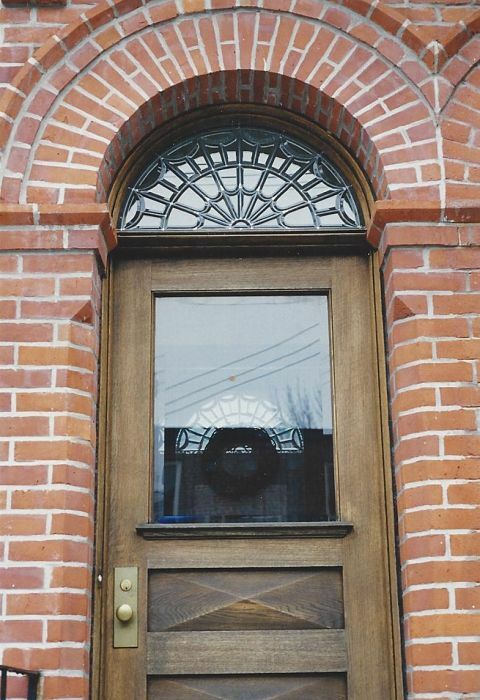 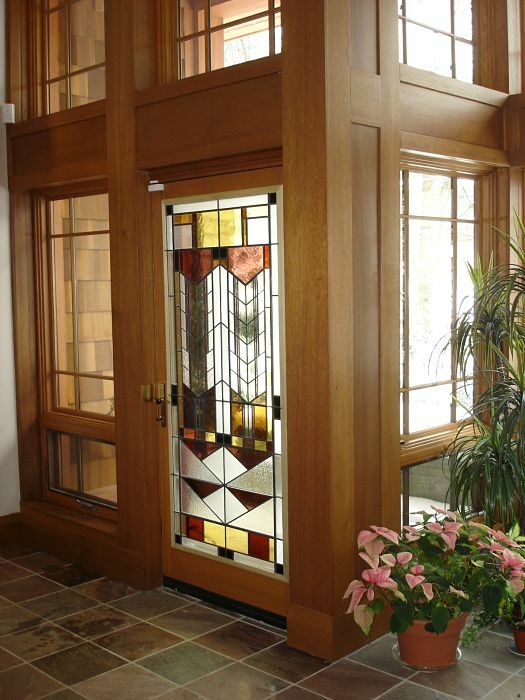 Stained glass sidelights and transom panel featuring Youghiogheny art glass. 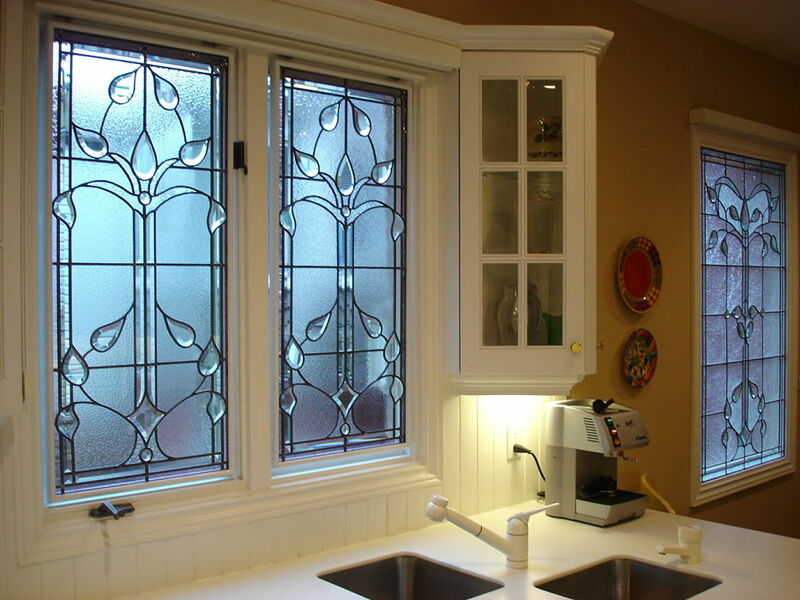 Leaded textural art glass in a kitchen window. 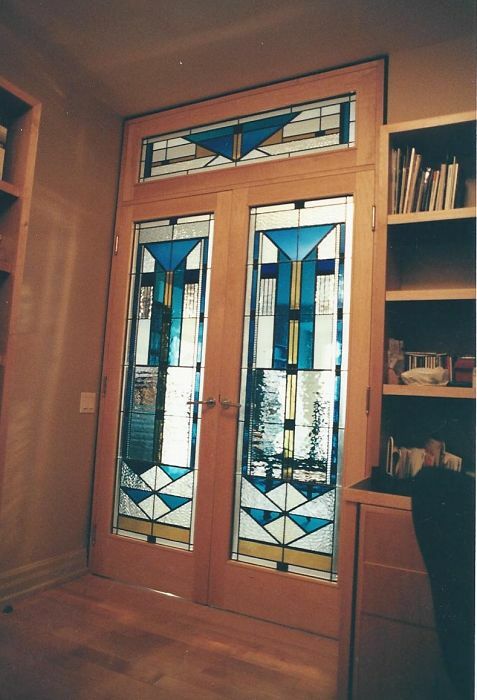 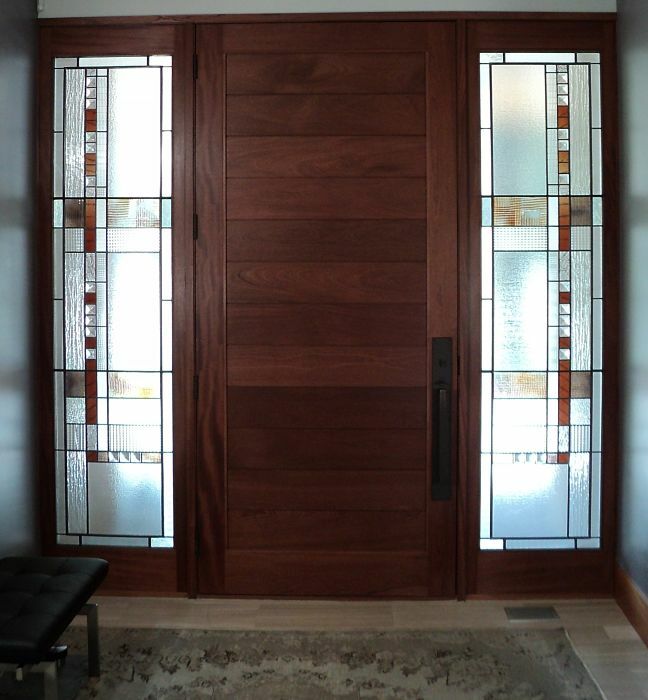 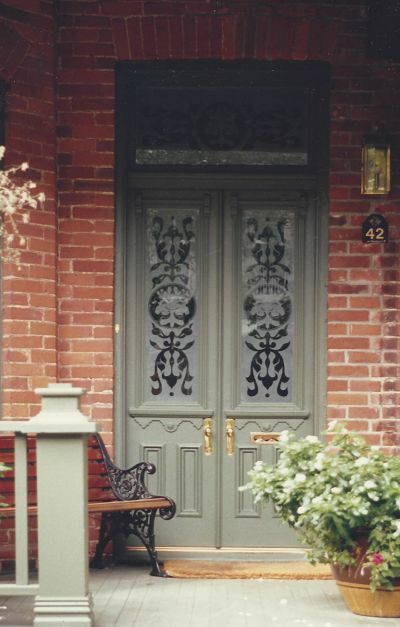 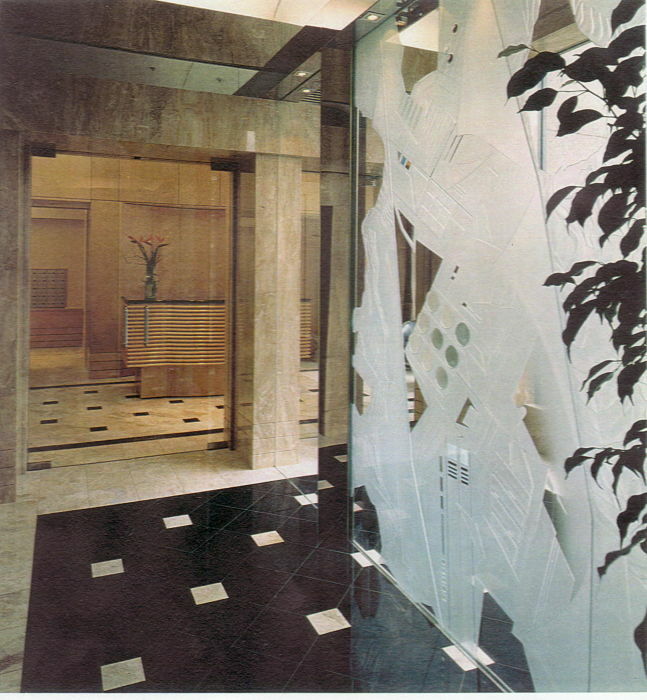 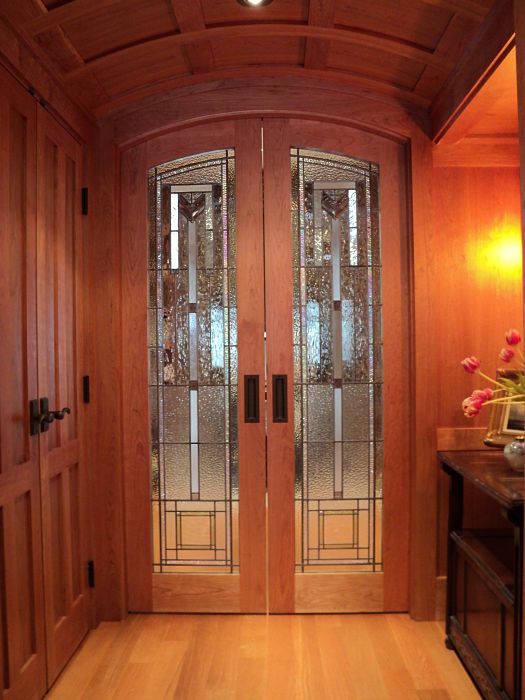 Leaded textural art glass in custom wood doors. 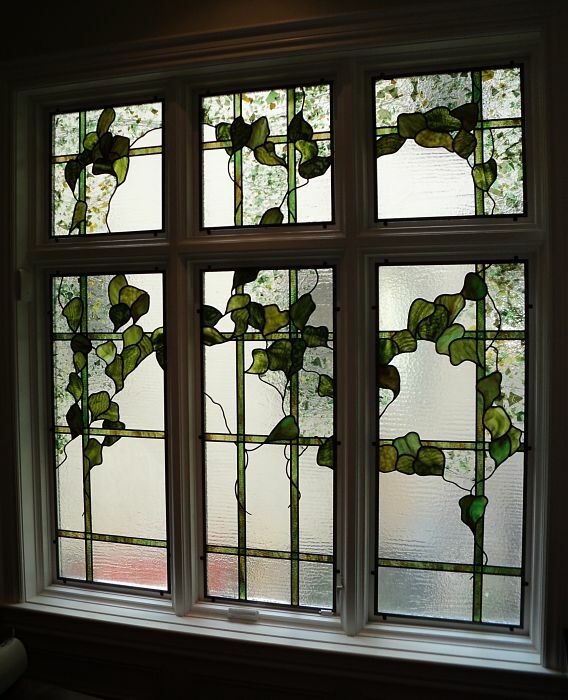 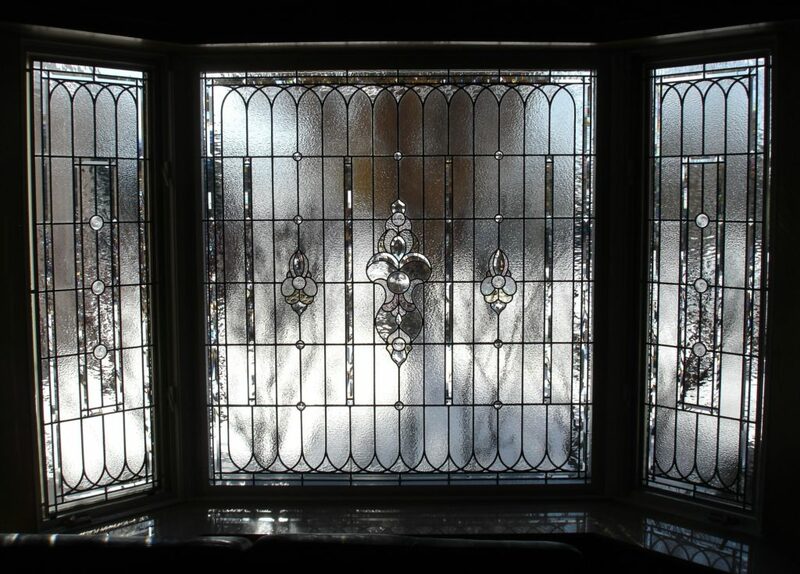 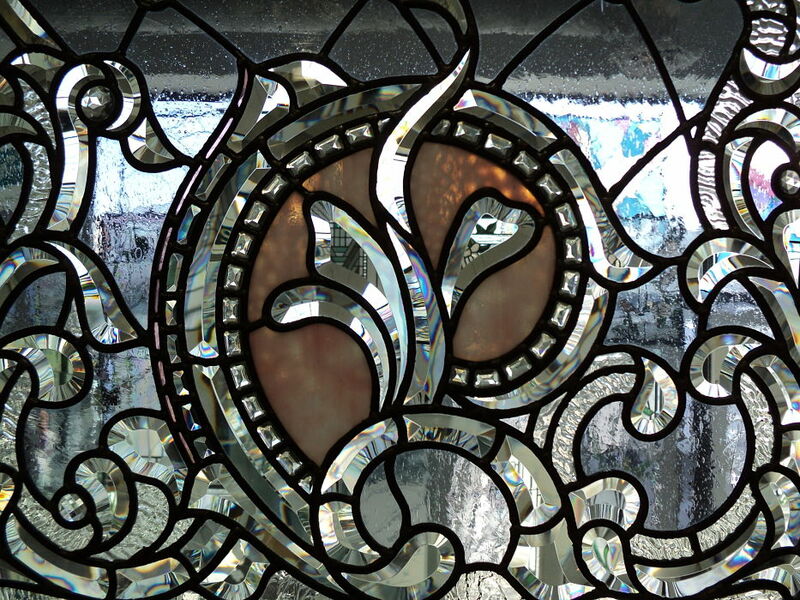 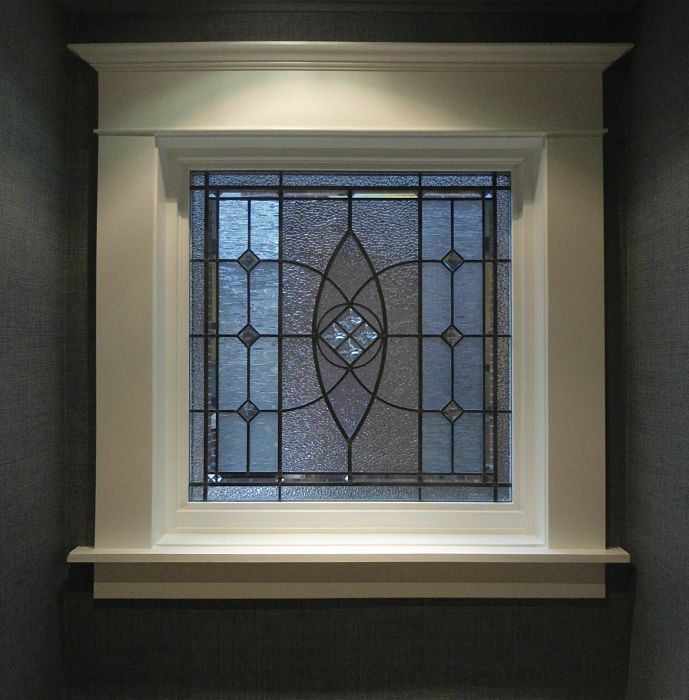 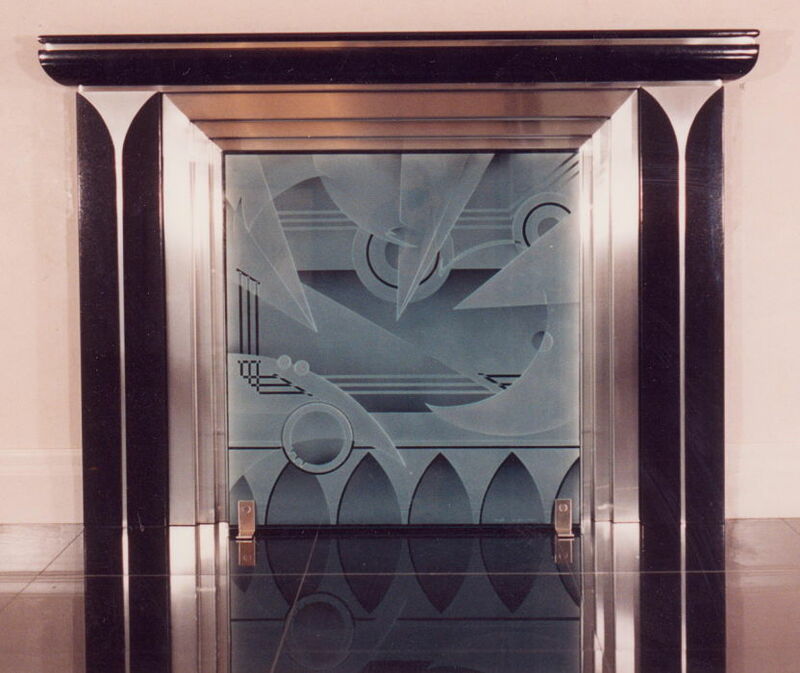 Leaded textural glass window with cast jewels. 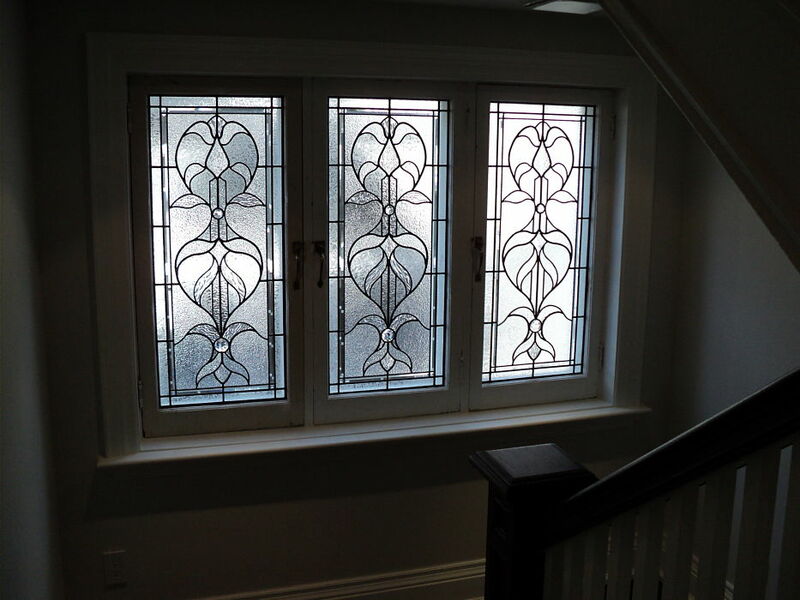 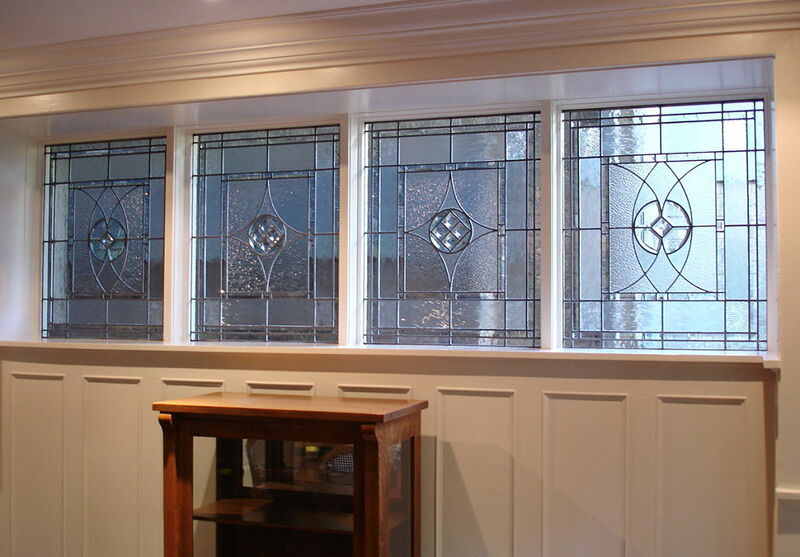 Custom leaded glass cabinet panels made with black 'antique' mirror. 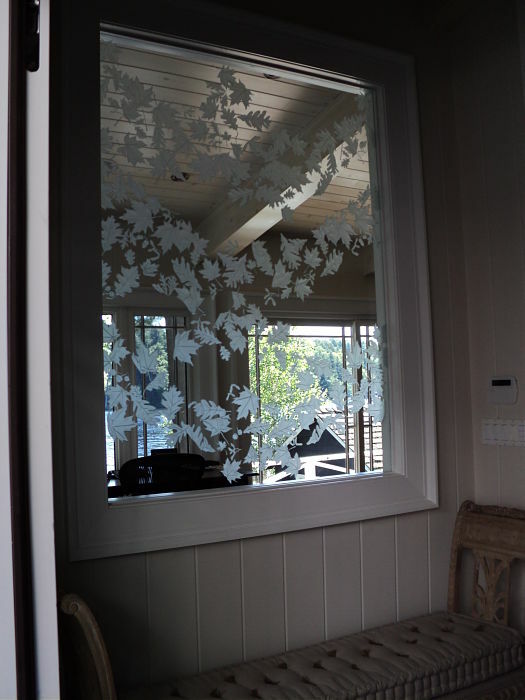 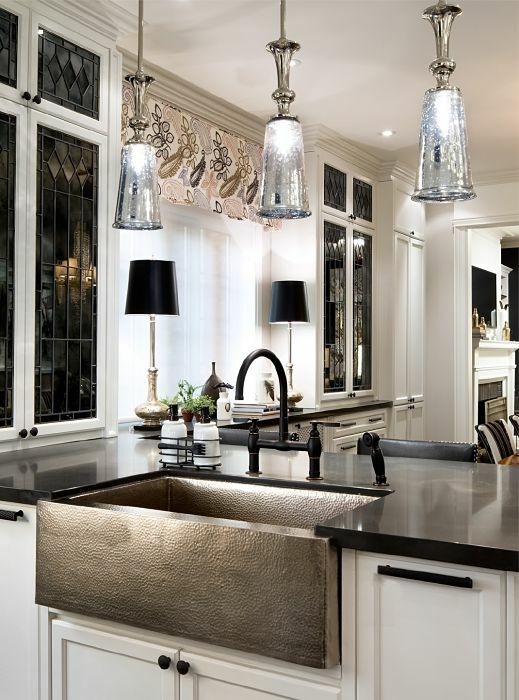 Commissioned by designer Candace Olson and featured on the 'Candace Tells All' television series. 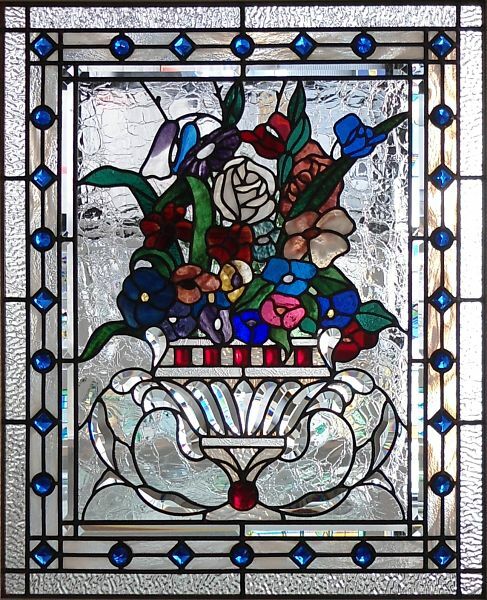 Season 3, episode 5 "Too Many Cooks in the Kitchen"
Stained glass window flower pot design with hand-bevelled glass, mouth-blown craquel glass and faceted jewels.